The FBI has selected Winchester as its 9mm and .40 cal. pistol ammunition provider (photo FBI). The Federal Bureau of Investigation (FBI) has just awarded Winchester Ammunition with their coveted 9mm pistol ammunition contract. Winchester’s PDX1 will be the Bureau’s duty round, and their Frangible SF rounds will be the Bureau’s training ammunition. This is on the heels of the Bureau selecting Winchester to be its .40 cal. ammunition supplier. 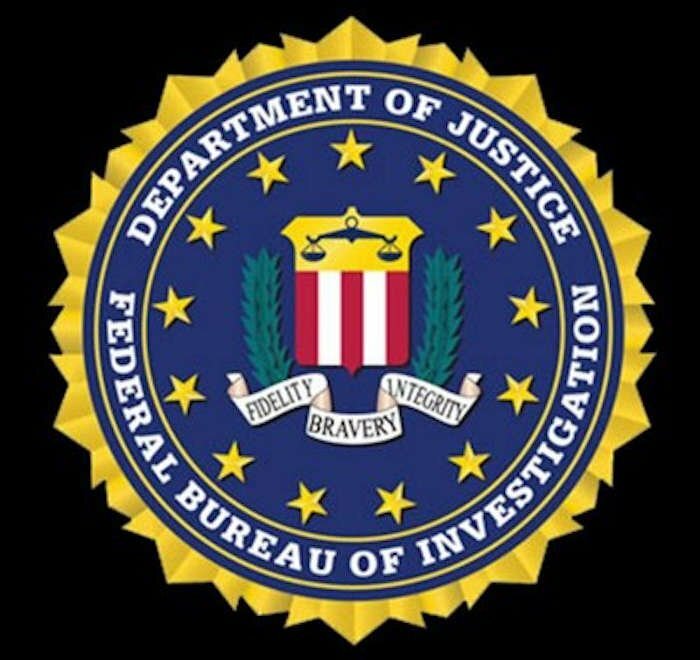 The vast resources of the FBI, and their reputation as the premier law enforcement agency in America, provides the Agency with enormous influence on American law enforcement. With an estimated 13,000 Special Agents, the FBI contract will not only be a significant order for the Agency, but will likely influence many more law enforcement agencies across the nation. Winchester is one of the oldest and most respected ammunition manufacturers in America. They are also no stranger to contracts with the FBI, other federal agencies (including the military), and many local and State law enforcement agencies. The bonded jacketed hollow points selected are an excellent choice, while the frangible training ammunition should help the Bureau maintain its range and even “go green” at the same time. The FBI contract is one more testament to the Winchester ammo prowess (photo by Winchester). Winchester’s PDX1 9mm cartridge with 147-grain jacketed hollow-point bullet was selected by the FBI for duty use by Agents carrying 9mm handguns. This is the same line the Bureau selected for its .40 caliber pistols. The PDX1 has been shown to be an excellent bullet design for self-defense purposes, with consistent penetration through a variety of intermediate barriers. In addition, the PDX1 bullets have shown reliable expansion with the bonded jacket technology. Winchester uses a patented technological process using a reverse-jacketed, bonded bullet for their PDX1 line of ammunition. This technology is a superior process from simply slapping a jacket around a formed piece of lead and hoping for the best. The PDX1 ammunition line uses an enhanced nickel-plated cartridge preventing corrosion and ensuring smooth feeding and extraction. Flash suppressed powder is used in this cartridge to maintain night vision and meet the FBI’s stringent darkened range evaluation. 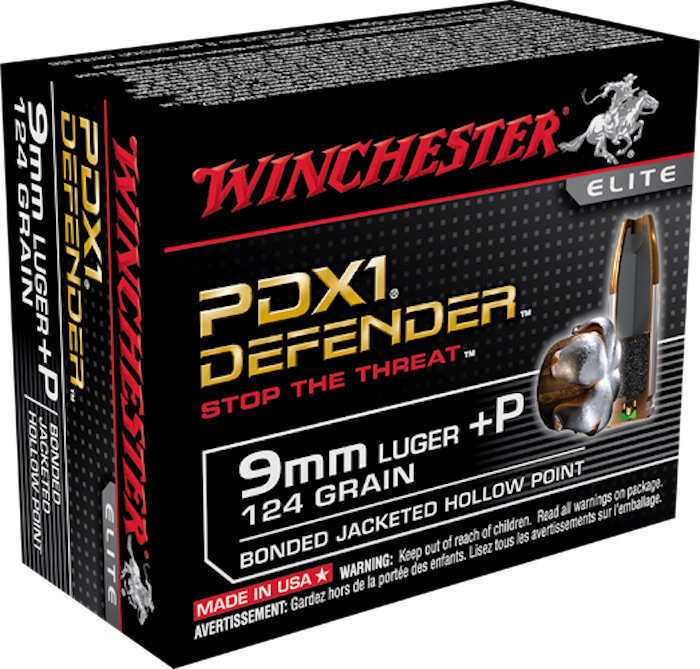 The FBI Winchester PDX1 bonded 147-grain 9mm cartridge is an excellent choice. The FBI PDX1 9mm bullet uses bonded technology. This is a modern design using a chemical process to bond the lead bullet to the metal jacket. The process creates a superior bullet design to ensure proper and full hollow-point expansion, while avoiding jacket separation that can significantly reduce bullet effectiveness. Winchester’s PDX1 uses a notched copper jacket. 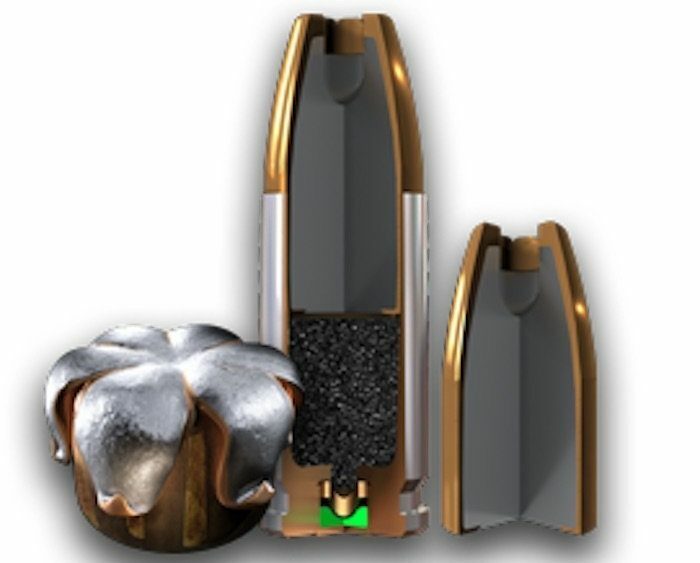 This design feature enhances the bullet’s expansion upon impact with soft tissue targets, avoiding problematic results from other simple hollow-point designs. I have witnessed a PDX1 gelatin shoot and the expansion has been both consistent and impressive. In fact, I have been so impressed with the PDX1 performance, I use PDX1 cartridges in my personal 9mm handguns. As the Winchester image shows, PDX1 expansion is impressive. The FBI has selected Winchester’s Ranger® LE Frangible SF™ ammunition to satisfy the Bureau’s massive training needs. Ranger LE SF bullets are a completely lead-free bullet composed of highly compressed powered metal. The announcement did not indicate if the FBI chose the 100-grain or 90-grain bullet. The Ranger LE Frangible SF line of ammunition is specifically tailored to law enforcement and military training needs with indoor ranges and steel targets in mind. The Winchester frangible bullets do not have a metal jacket that could become a projectile. Instead these bullets are pressed into shape under extremely high pressures to ensure quality and dependability during firing. When the frangible bullets impact a hard surface, or even soft tissue, they burst apart into tiny powdered fragments. Winchester’s Ranger LE Frangible SF bullets are ideal for indoor ranges or steel targets. Frangible bullets are sometimes required by indoor ranges looking to reduce their lead exposure to shooters, and extremely costly EPA guidelines for lead disposal. However, even more important, the powered metal bullets literally disintegrate when striking hard surfaces with almost no significant pieces to cause unwanted projectiles. This allows military and law enforcement officers to train for close quarters battle without the risk of lead or jacketed bullet projectiles causing harm. Having used these types of bullets in the past, I have been amazed at the ability to shoot steel targets less than (1) yard without any noticeable ricochet or concern. The FBI has some of the most stringent and systematic testing procedures for both firearms and ammunition in the world. The FBI testing procedures have been adopted as “standard” by many law enforcement agencies and civilian shooters. Winchester PDX1 and Ranger LE Frangible SF rounds are winners, and there should be no doubt about their effectiveness and reliability. I think the FBI did very well here, and Winchester’s PDX1 and Frangible SF ammunition is a definite winner. Do you know if anyone has tested the new FBI 9MM Winchester PDx1 147gr in the Glock 43 or the 124gr. Many officers in our carry G43 for their backup. I read in April 2017 that the FBI had chosen Hornady Critical Duty 135 gr 9mm as its new issue ammo. Which is it? I try to carry what the FBI does in the horrific event I need it; bottomfeeding lawyer protection. Thank you. Robert we saw that as well and were somewhat perplexed. It appears the FBI has authorized more than one cartridge of 9mm ammunition, while Winchester claims to have the sole source for .40 S&W ammunition to the FBI (older Glock 22’s during the transition to 9mm). EAST ALTON, Ill., 5/23/2018 – Winchester Ammunition was recently awarded a contract from the Federal Bureau of Investigation (FBI) for its Duty and Frangible training 9MM pistol ammunition. Winchester also received a contract from the FBI as the primary source for .40 S&W pistol ammunition in fall, 2017. The 147 gr. bonded jacketed hollow point (JHP) duty cartridge selected by the FBI is designed with patented technology that utilizes a reverse-jacketed, bonded bullet that can penetrate a wide variety of intermediate barriers while maintaining very consistent target penetration and reliable expansion. The nickel-plated cartridge prevents corrosion and ensures smooth feeding and extraction. Flash suppressed powder is used in this cartridge to maintain an agent’s night vision and meet the FBI’s stringent darkened range evaluation. “Winchester has been supplying the FBI with service and training ammunition for many years and is honored to be awarded this recent contract and continue to support our nation’s premier law enforcement agency,” said Matt Campbell, vice president of sales and marketing for Winchester Ammunition. Our local agency’s use Winchester 124 grain +p T series. I have three family members that are LEO’s and they say it’s very effective. The new, modern Black Talon.